The walls in my home are painted in white and I remember pouring over all the different whites before finding that perfect shade. My latest attraction has been black walls though. I'm not sure I can make it work in my home but it is nice to look at don't you think? This photo is by the lovely Victoria of sfgirlbybay. She is working on creating a little breakfast nook, just off from the kitchen and this is a teaser photo she posted showing her progress. 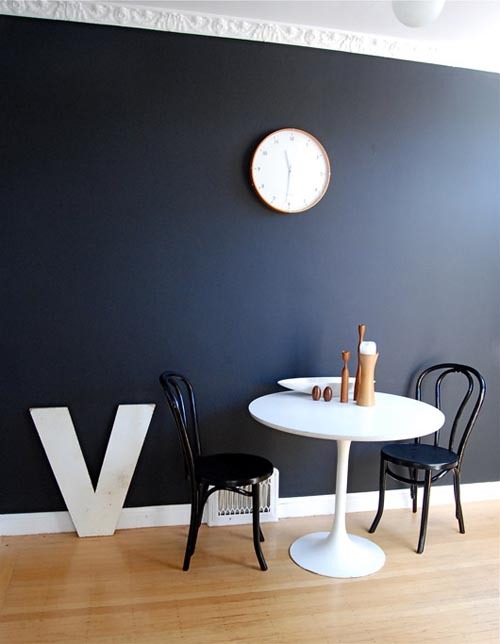 She used chalkboard paint for the black wall and I love the way it almost looks as though it is almost glowing from within. The other reason I am attracted to this photo is because of her black painted bentwood chairs. I really should get moving on mine. I can't wait to see more of her home. To read about her progress see here. Thank you Victoria for allowing me to share.